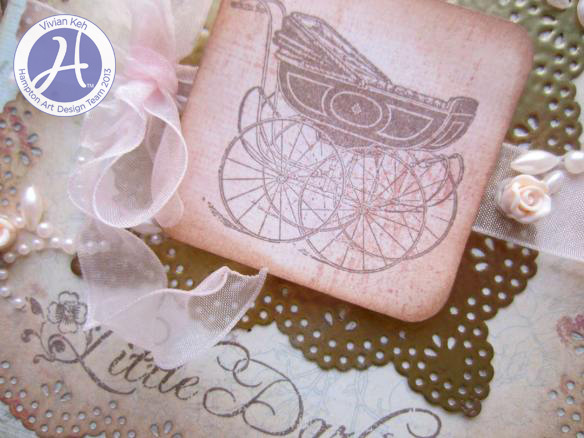 Vivian here today to share with you a pair of vintage inspired baby cards using Hampton Art and Graphic 45's Little Darlings Cling Stamp Set. A close up of this beautifully detailed image! 1. Cut brown cardstock to standard A2 card size. 2. Cut patterned paper pieces. 3. Punch the doily border piece. 4. Stamp and fussy-cut focal image. 5. Distress all edges with distress ink. 6. 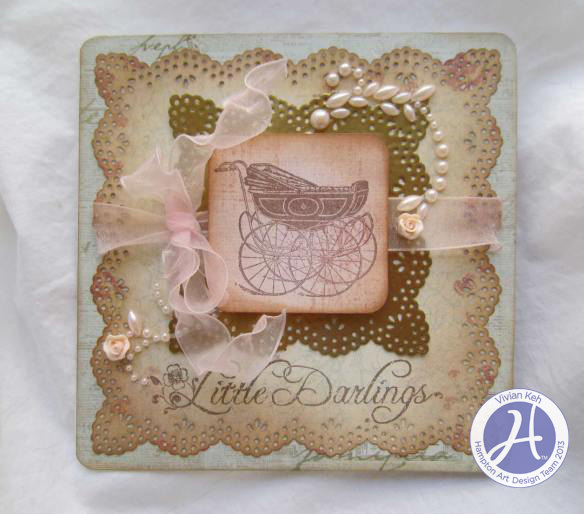 Assemble card and add embellishments. I made second card project with soft pinks and creams for a newborn girl. This stamp set is full of precious imagery and sentiments and helps you easily create a vintage vibe in your projects. 1. Cut square card base and a piece of patterned paper to measure 5 1/4 in. 2. Cut second nested piece of patterned paper to measure 5 in. 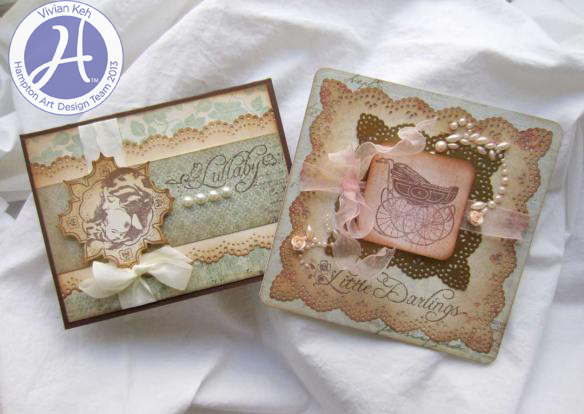 Punch corners and edges with border punch. 3. Cut third nested piece of cardstock to 3 in. and punch corners and edges with border punch. Heat emboss entire piece in gold. 4. Stamp image and cut smallest nested square to fit inside gold piece. Round edges. 5. Distress all pieces and assemble card.6. Add bling and embellishments. Hope my projects inspired you to create! Thanks for visiting with me here today and see you back here soon! 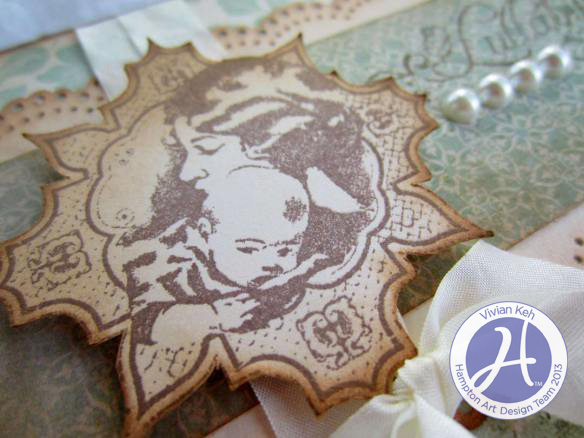 These vintage baby cards are just beautiful!! Hi Cheryl! Thanks for stopping by and following us! The colors and textures are just fantastic. Hi Sharon! Thanks for the compliments here! Very cute and so different. Nice work. Thanks, Dorina, for your continued support here at Hampton Art! I love your vintage baby cards. Very unique.